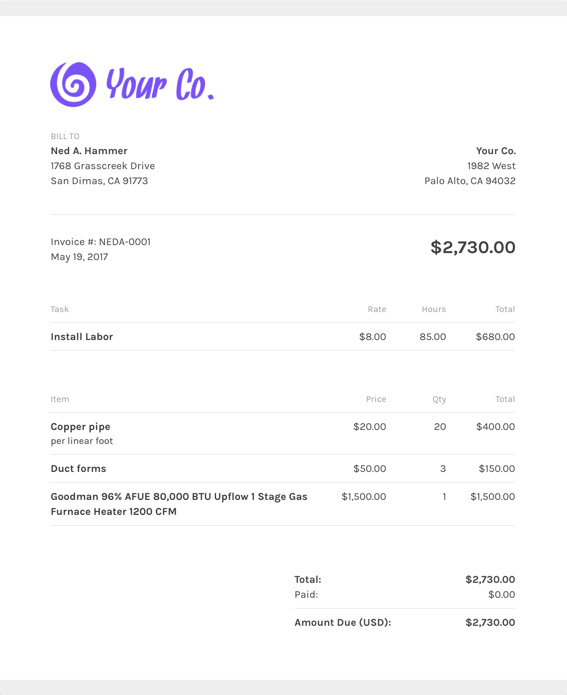 Looking for handyman invoice templates? We've got you covered! Do I need more than just a handyman invoice template? As a handyman, you have to travel a lot to put in a lot of hard work. This shouldn't stop you from getting paid fast. That's why ZipBooks' handyman invoice templates can be created and sent from an iPhone app, which means you can send it from anywhere at anytime. The sooner you can send out an invoice, the sooner you can get paid. What should I include on my handyman invoice template? One popular selling point about ZipBooks is that you can save default settings for your invoices (like company logo and header and footer color) once you nail down the invoice details. Using ZipBooks for your handyman invoice means never sending off an invoice without your own company’s information on it (oops!). We’ve collected data from tens of thousands of invoices and use it to score your invoice based on what information you include so you’ll get you paid faster. Why should I use ZipBooks’ handyman invoice template to create and send my handyman invoice? Plumbers, HVAC professionals, electricians, tinners, welders, and all other skilled craftsman that build and bill stuff, come on in! We've got the invoice template, time tracker, expense management all-in-one tool that will make your life easier. Now if they could just take the calories out of a Big Gulp without killing the taste.